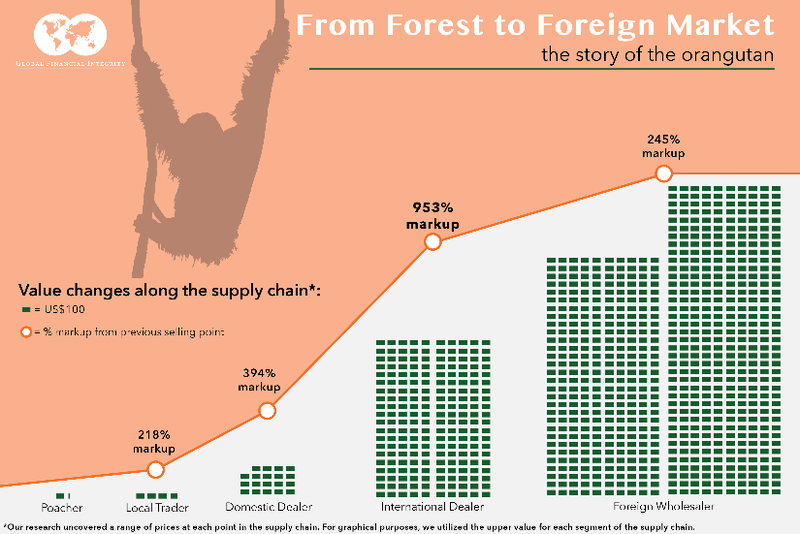 WASHINGTON, DC – Criminal networks of poachers, suppliers, dealers, wholesalers, and consumers make up the multi-million dollar industry in live great apes, their bushmeat, and their body parts, and investigators are missing intelligence and enforcement opportunities on these illicit financial flows, according to a study released today by Global Financial Integrity (GFI), a Washington, DC-based research and advisory organization. 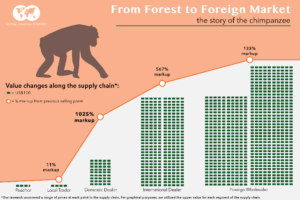 The live trade is the most significant in terms of value, and the markets for bushmeat and body parts are linked with the highest impact on the survival of the four species—bonobos, chimpanzees, and gorillas in Africa and orangutans in Indonesia and Malaysia, all of which are endangered species. Dealers are the most important actors in the illicit supply chain, typically earning the greatest profit compared to other participants. 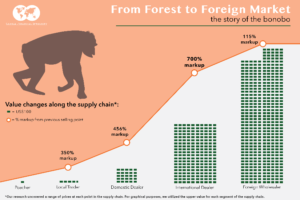 Thousands of bonobos, chimpanzees, and gorillas are killed each year to fill the demand for pets and attractions, bushmeat, and ceremonial body parts, generating significant revenue for those who make up the illicit supply chains. Orangutans on the islands of Sumatra and Borneo in Indonesia and Malaysia—Asia’s only great apes—are losing their battle for survival due to habitat destruction from commercial plantations, the killing of adults of the species, and the selling of orphaned infants on the black market. Governments need to increase the consequences of buying or trafficking great apes illegally, so that it is no longer such a “safe” and profitable crime. 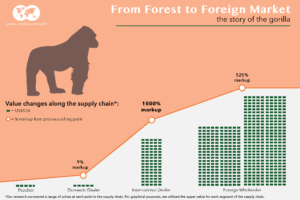 Governments, civil society groups, and the CITES Secretariat should increase public reporting on investigations, arrests, prosecutions, and seizures in the illegal great ape trade to mobilize all stakeholders. Governments, civil society groups, and journalists investigating the illegal buying and selling of great apes need to include the movement of money from these activities as a core component of their investigations, because money is the key driver of these crimes. 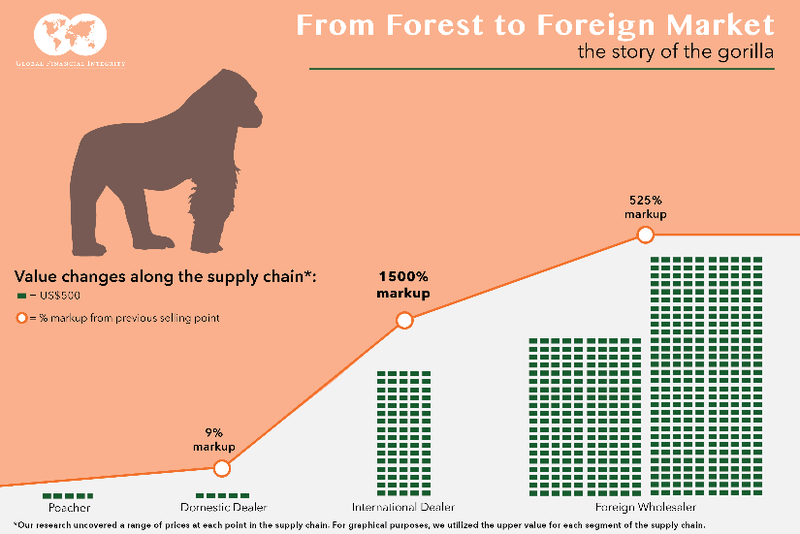 Participants in the illegal great ape trade are increasingly using social media to conduct business, and governments, the CITES Secretariat, civil society groups, and the private sector need to come together to deny these criminals and their buyers access to these platforms. To conduct the study, GFI compiled data based on publicly available documents, original interviews with experts, and special questionnaires to individuals and groups in Indonesia, Malaysia, and Central and West Africa. 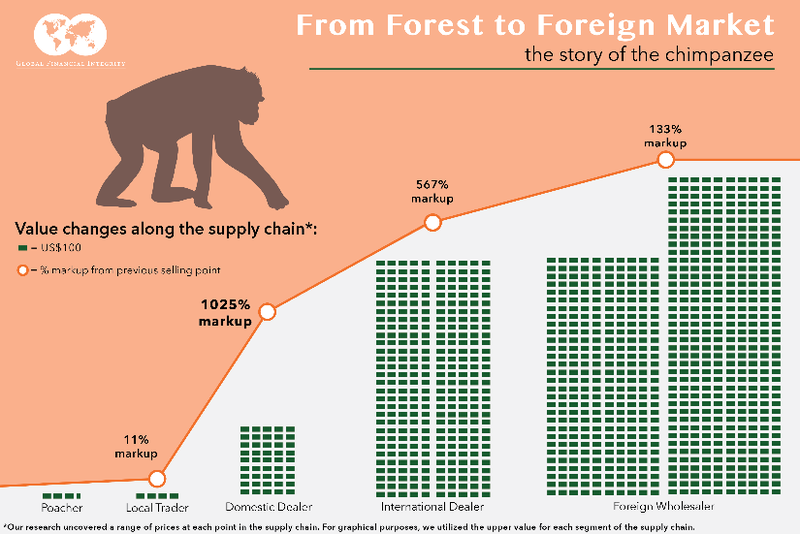 The report restricts estimates of market values to the international side for live bonobos, chimpanzees, and gorillas, because those transactions are the most consequential and have the most robust data. Data on bushmeat and body part sales are much more limited, so the estimates in the report lump bonobos, chimpanzees, and gorillas together; orangutans did not have sufficient data for this portion. 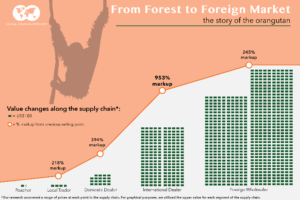 The source of the estimates of the number of each species involved in the illegal live trade comes from Stolen Apes: The Illicit Trade in Chimpanzees, Gorillas, Bonobos and Orangutans by Daniel Stiles et al. ; estimates for the number killed for the bushmeat and body part trade come from research by The Bushmeat Project.